RA2 – working with John Zeldis and others modelling the coastal carbonate systems. Along with my colleague Sara Mikaloff-Fletcher we hope to use the monitoring data from RA1 (and previously collected data) from single sites and use some clever maths to extrapolate what the carbonate system might be doing in other coastal areas around New Zealand that we currently don’t have the resources to monitor. My work days vary depending on what project I am currently working on. I spend a little more time than I would like at my computer. Most of this time involves analysing data and writing/editing/reading proposals, reports or papers. A lot of time is spent communicating with other researchers, with meetings, but also email and Skype with colleagues overseas. I try to get in the laboratory every few months to get my hands dirty. I spend several hours a week talking with my students and making sure they are on track with their projects. Coastal ecosystems are diverse and they provide considerable enjoyment, including for recreation and provision of kaimoana. However, these regions could be under threat from a raft of different climate and human influences - one of which is ocean acidification. This could have a significant effect on the coastal regions – creating dead zones, or regions where some species take over. At high school I studied chemistry, maths, economics and art. Then at university I studied natural sciences, specialising in earth sciences. I then did a Masters in carbonate petrology and a PhD on chemical oceanography and past changes in the Southern Great Barrier Reef, Australia. I hope we can identify the coastal areas around New Zealand that are potentially most at risk of future ocean acidification. Understanding the effect of ocean acidification on individual marine species, and how these might flow on to the ecosystem in general is one outcome we aim for. Working with community groups and the public on this will also help to build awareness of the issue. Working in a multidisciplinary team, all approaching the problem from different perspectives is very educational for everyone involved as we all learn from each other. The key will be bringing all the data together, as the sum of the results from different sub-projects is much greater than the individual sub-project results. I am also excited about getting the community and iwi involved, as this will expand the amount of science that the small science team can do, but also help to come up with future management strategies. I lead RA1, the monitoring component of CARIM. Work in this RA aims to determine the variability of coastal pH and the carbonate system at 3 sites – Hauraki Gulf, Nelson Bays and Karitane. The information from this component also informs the perturbation experiments (where we manipulate pH and temperature), and the modelling work we are doing. We are collecting time-series records of how pH varies, and are also looking at biogeochemical parameters to better understand factors influencing coastal acidification and ecosystem response to coastal acidification. Permanently mounted sensors provide data on day (diel) and tidal variability of temperature, pH and related measures and capture short term variability due to local events such as riverine input, phytoplankton blooms, and hypoxia (low oxygen levels in the water). I mainly work at the Karitane site, where we have two moorings – one close to shore in a kelp bed, and the other in 12m of water outside the kelp bed. There are sensors on the moorings which take measurements every 30 mins, and we visit the site every month to take water samples and to check on the instruments. I work with staff and students from the Dept of Marine Sciences at the University of Otago, and with local people from the East Otago Taiapure who are also conducting research on the ecology of the area. The Puketeraki Nga Waka Club, based at the Kati Huirapa Runaka ki Puketeraki at Karitane, also take water samples for us. We then analyse the samples, maintain the instruments and work up the data. The data will be available on the website (work in progress). I don’t really have an “average” day! Some days I am in the field. We travel by boat to the field site at Karitane, then I work with the divers to check the instruments and collect water samples. Back in the chemistry lab, we analyse the samples and clean and maintain the instruments. In the office I do the calculations, maintain the data base, and write reports and presentations. 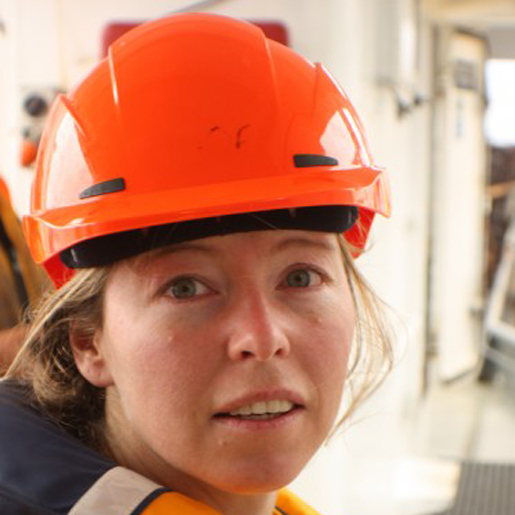 I also work with other scientists on CARIM to put my field measurements in context with the experiments that they are going. One of the things that I really like about my job is that there is no “average” work day – there is a lot of variety and I use a lot of different skills. The coastal environment is a key part of our ecosystem, and also a key part of our identity as New Zealanders. Ocean acidification is likely to change this environment, the plants and animals that grow there, the kaimoana we gather, and the industries that are dependent on the environment. It is important that we understand the changes that are happening, are able to minimise the impacts where possible, and to adapt where necessary. I studied science at Wakatipu High School, and enjoyed many outdoor activities. I then went to the University of Otago where I graduated with a BSc(Hons) in Chemistry. After working for a bit I returned to University to do a PhD in marine chemistry. I wanted to work in an environmentally important field,and to do a job that had a lot of field work. We will have a deeper understanding of the environmental conditions at three key sites, and the drivers that affect the pH in those areas. We will also know how those those environments are likely to be affected in the future by ocean acidification. We will also be able to identify which shellfish and other plants and animals are most likely to be resistant to these future impacts. In addition, our work will help to raise awareness in the general public, coastal communities, aquaculture industries of the issues around ocean acidification. Working with people with different backgrounds, and different skills and different approaches (botanists, geologists, ecologists, modellers, aquaculture experts, local community organisations etc) to investigate the issue of ocean acidification. Scientist. Marine Biogeochemist. NIWA, Wellington. RA3 – I am involved in the design, sampling and analysis of large scale mesocosm experiments (4,000 L test tubes) to determine the effects of temperature and pH on natural planktonic (free floating micro-organisms) populations. In particular, I manage the implementation of a novel experimental system called the Mesocosm Automated Flow Through System (MAFTS). MAFTS pumps water 24/7 through several instruments and is used to track hourly changes over the duration of the experiment [nutrients – nitrate, optical properties of the water (beam attenuation), salinity, temperature, pH, oxygen, turbidity, coloured dissolved organic matter, chlorophyll, and phytoplankton photosynthetic characteristic]. Each mesocosm also has light sensors deployed top and bottom to monitor changes in sunlight, sediment traps to assess material falling out of the water column, and strips to monitor growth on the inside of each bag. I bike to work, recover, then juggle the backlog of data to be analysed and processed in cunning and mysterious ways. This typically involves using a statistical and graphically programming language called ‘R’ (or sometimes Rrrrrrrrrrrrrrrrrrrrrr!). The challenge is to masticate data into a palatable form that is easy to analyse and plot effectively for scientific endeavours. I specialise in optical water quality (water colour and clarity - aquatic optics, ocean colour) and the link to the water column components (phytoplankton, suspended sediment, coloured dissolved organic matter). Man, impact, consequences! One consequence is a predicted increase in ocean acidification due to rising atmospheric carbon dioxide levels dissolving into the water. The coastal ocean is a crucial and sensitive habitat of high ecological and resource value, and we are uncertain of responses to ocean acidification. Researching the effects of coastal acidification on sensitive organisms (micro- and macro-scopic) will assist in assessing impacts and improving knowledge for future planning and mitigation options. I was mainly interested in sciences and technical drawing at school. I was initially unsure what I wanted to do in my first year at Massey University (Biotechnology, Biochemistry, Physiology?) and kept my options open. I ended up completing a BSc and MSc in Biochemistry. My MSc involved using ‘pigs’ as a model for humans, researching the digestion and physiological effects of heated foods. This is a bit different from how my science career has ended up in more liquid environs! Improve and communicate knowledge in ecosystem resilience to higher temperature and lower pH conditions. In particular how does the planktonic (phytoplankton and zooplankton) community respond, and what might be the food chain consequences of this. This will help guide implications on future resource management. New knowledge and experience. Being part of an inter-disciplinary team and approach to real-world problems. Science is always challenging, particularly with the integration of technology to environmental monitoring. New methods, techniques and instruments are constantly evolving, allowing monitoring in unprecedented detail in space and time. The CARIM mesocosm experiments provide the opportunity to implement new methods and track changes in time under tightly controlled conditions, something that is difficult (or nearly impossible) in its natural, spatially variable state. Research scientist at Cawthron Institute. 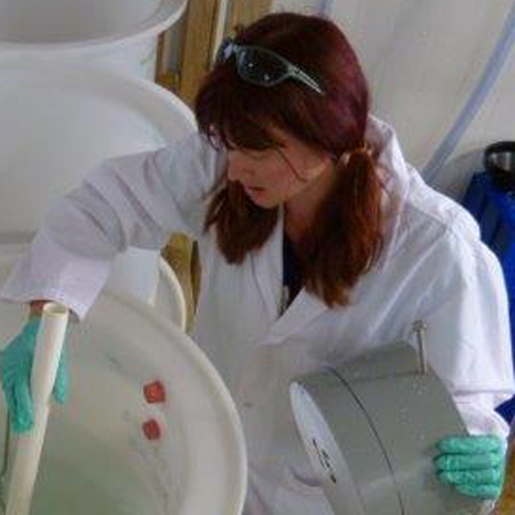 I’m an ecophysiologist, working on RA 4 and 5, working on Greenshell mussels (GSM). We’ll also be contributing to RA 3 work on GSM larvae in mesocosms. I’m helping with all of the experiments around screening mussel families from the selective breeding programme to see how much variation exists in the species that may allow them to adapt to ocean acidification. I’m also working on experiments investigating the mechanisms that cause resilience or susceptibility to ocean acidification, and investigating the inter-generational effects of ocean acidification. Designing experiments, running experiments in the lab, analysing data, writing papers and communicating the results to stakeholders like the mussel industry and the public. It’s SO important. Coastal acidification may have major impacts on the functioning of our coastal ecosystems and our ability to grow and harvest seafood. It’s really important that we work out what is likely to happen, how these species and ecosystems may be affected and what we can do to avoid negative effects if possible. At high school, I did lots of music, Spanish, biology, calculus, chemistry, English. Through our work we hope to discover whether these key, iconic NZ species will be able to evolve to handle the challenges of increased ocean acidification over the likely time-scales they will face. The wider project will give us an idea of the rates and time-scales involved. This will tell us whether these animals and plants will have the capacity to adapt to an acidifying environment, or whether they will be unlikely to be able to cope. This should help inform what we can do to mitigate the effects of rising carbon dioxide on our marine environment and protect these ecosystems and the environment for future generations. Another big part of the CARIM programme is the outreach, so as well as the science giving us interesting outcomes, I hope that one of the big outcomes is a better informed public so that people understand what is happening, and what they can do about it! The scientific questions and the techniques that we’re using to answer them are exciting, but the thing that most excites me about this project is the chance to create new knowledge and get it out to a wide audience so that people can be more informed about what we’re doing to our environment, and how we can better care for and protect our coastal ecosystems for the future. Scientist and science communicator, Curiosity Communications Ltd. I also hold a separate role as National Coordinator, Participatory Science in the Office of the Prime Minister's Chief Science Advisor. RA7 Leader, Engagement and Outreach. I manage the engagement aspects of what we do in CARIM, including running social media platforms, this website, and working with a range of people to look at ways to share what we are doing in CARIM and help inform people about ocean acidification. Research new popular media and scientific outputs as well as current CARIM happenings that I can share via our CARIM social media channels. This is so that people have a better understanding of ocean acidification and other ocean threats, and how CARIM is working towards better scientific understanding. I also work on website content, by collating and writing about material I've been provided from members of our CARIM team to share the work we are doing in an easy to understand manner. I also solicit new material for the website and social media from our team. I think about ways to generate other content (e.g. material for schools) on what we are doing and work with others to create that content. Ocean acidification is a major threat for our marine ecosystems. Coastal acidification has been little studied, but due to its connection to what happens in land environments and as a place where important marine species live requires much better understanding. Our coastal species are likely to be impacted by coastal acidification, so it's important to learn much more about rates and consequences. Biology, Chemistry, English, Latin and Maths. After High School I decided to study Sciences at university and discovered genetics and biochemistry and was mesmerised. I did a BSc(Hons) in Biochemistry and then went on a fabulous journey to do a PhD on the molecular evolution of a major blood protein on a whole range of species, including Antarctic fish. I secured a scholarship to Antarctica near the end of my PhD, which gave me a month on an eco-tourism ship. That led to years of research, mainly on Antarctic fish and shellfish, including ocean acidification research. And alongside that a growing interest in science communication and public engagement. I think that we will make a tangible difference to understanding of ocean acidification and management of it as a threat, both within New Zealand and internationally. In addition, there will be much greater awareness of ocean acidification across New Zealanders. Hopefully the outcomes will also include identifying adaptation possibilities within our target species. The ocean acidification research community in New Zealand is a highly collaborative group of people, good at all doing their part to contribute to a large research project. I really enjoy working with this team and aiding them in sharing their results more broadly. This is an important and worthwhile project to be contributing to, and its multidisciplinary approach is one of its strengths. Atmospheric and Ocean Scientist, NIWA. I’ll be contributing to RA2, Sources and Seasonality of low pH and carbonate in the Hauraki Gulf. My role is to develop mathematical algorithms that will help link the measurements being made in the Hauraki Gulf with the high resolution modelling of this region. 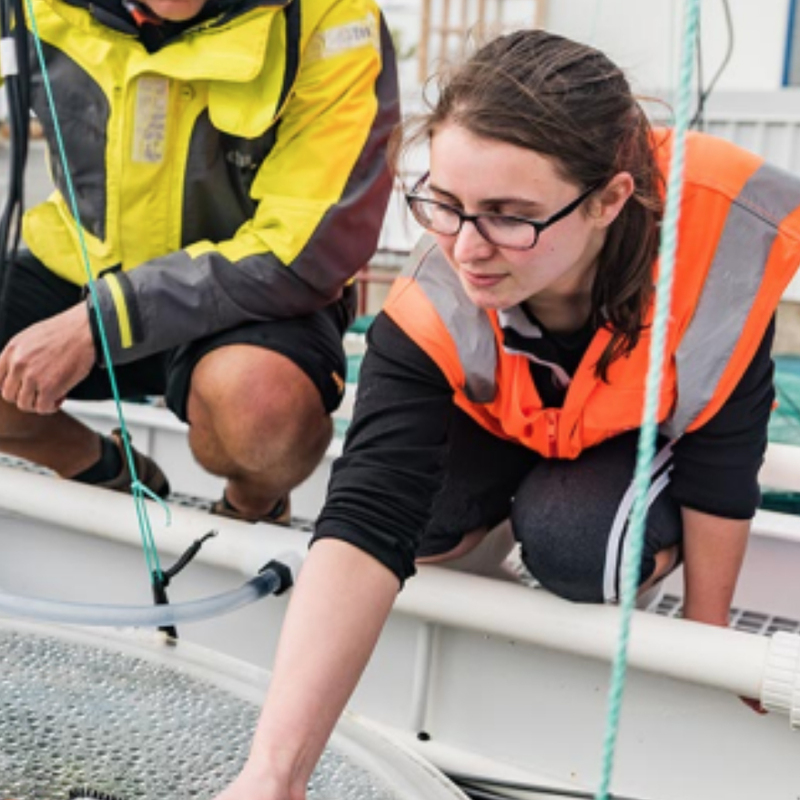 This will allow us to produce high spatial resolution, seasonally varying maps of carbonates in the Hauraki Gulf, giving scientists and policy makers an idea of the range of conditions organisms in this region already experience. It will shed new light on the ability of organisms in the New Zealand region to adapt to ocean acidification. If successful, it could be an important part of a future mitigation strategy, providing rapid information about change in the region. Once proven in the Hauraki Gulf, it could also be adapted and used in other regions of interest. Write and run computer programmes that model the atmosphere or ocean or analyse atmospheric or oceanic data with statistical methods. Create beautiful and complex graphics to help visualise and understand model simulations and data. Write an email to a colleague living overseas to discuss a research idea or project. Have a stimulating discussion with people from at least four different countries, right here at NIWA in Wellington. Drink an alarming amount of coffee. Ocean acidification is likely to impact all ocean habitats, but coastal regions are especially vulnerable because runoff from land regions can exacerbate acidification. While we are impacting coastal areas with carbon dioxide emissions and land management practices, coastal ecosystems are among the ocean ecosystems that impact us the most directly. These regions are home to many commercial fisheries and species of ecological or cultural significance to New Zealand. In high school, I loved art, creative writing, literature, and arguing about politics with my friends. I always did well in maths and science, and took the most advanced courses offered at my school, but I imagined that I would end up as a novelist or artist. It wasn’t until I took my first science courses at university that I discovered a real passion for science. By the end of my first year at university, I had decided to major in Chemistry, a decision I’ve never regretted. For the first time, we will have a clear picture of how variable pH is in coastal waters around New Zealand and how quickly acidification is occurring in our coastal waters. Then, we will come together as a research community to understand what that means for marine species that are ecologically, economically, and culturally important to New Zealand. I’m excited about the opportuntity to work on an interdisciplinary team with some of the best scientists in New Zealand to tackle a major threat to coastal ecosystems. Lipid Chemist, Cawthron Institute, Nelson. I am working with Cliff Law from NIWA looking at changes in microbial communities under ocean acidification challenge (RA3). I spend most my time understanding how lipids are produced. Lipid (or fats and oils as they are more commonly known) play vital roles in cell and animal function. We now know the importance of omega-3 oils for human health, which originate from the marine microorganisms. However, there is a whole variety of interesting lipids out there, some of which have very important human health properties. Costal acidification is a massive change to the marine environment and will have ramifications throughout the food web on a macro- and micro- level. Understanding the effect acidification has on lipid production in the oil factories (the marine microalgae) in the ocean could predict or help us understand how the microbiological communities will adapt to this challenging environmental change. Changes at a microalgae level may have huge ramifications further up the food web. After School, I studied at Melbourne University in the Chemistry department with a honours in Natural products chemistry. My introduction to oils was looking a microalgae from Antarctica looking at oil profiles of different species trying to understand food web ecology. I did my PhD in Tasmania at UTAS and CSIRO looking at alternative oils for salmon Aquaculture. This fundamental understanding of the mechanisms of significant change in the marine environment with prepare NZ, and the world, for some real challenges in the not so distant future. This is what you do science for, trying to answer big questions, Trying to predict things that cannot be easily predicted. Trying to understand things on a chemical level which will have implications on biology, the marine environment and how we feed ourselves in the future. These difficult science challenges is why I studied chemistry at university and hopefully contribute to the greater understanding for an uncertain future in regards to the marine environment and all its pressures. Marine Ecology - Coastal Monitoring and Research, Cawthron Institute, Nelson. RA1. Variability of coastal pH and the carbonate system. I’m responsible for deployment of sensors and collection of water samples in Tasman Bay. I work on a lot of different projects. I work with councils to help them make decisions about how to manage their marine environments. I also help communicate information about the marine environment to the public. I’m also working with iwi on ways to rebuild important populations of kaimoana. I’m often out in Tasman Bay diving and collecting data to measure the effects of aquaculture and other activity, and also doing work for the CARIM project. It’s so important be able to understand what is happening at a range of scales. You can’t understand everything about your local area without looking at what is happening around the country, and around the world. At school I was into English, art and photography, and didn’t study science past fifth form (year 11). After I got my BA in English Literature I worked in publishing and marketing, but after five years decided to go back and study marine sciences. The OA work will provide information on large-scale (big picture) change, which will be important in a lot of the small-scale work we do. That’s why it is great to be able to contribute to this work. The results from this project will be relevant to nearly every aspect of marine health and management that I work on. The results will be useful for a whole range of people for whom the marine environment is important, but in general those people wouldn’t be able to address questions about ocean acidification themselves, because of the scale of research required. RA3—providing support for the filtering team and doing a whole lot of filtering myself. My average day is fairly variable as I am the sole lab tech for the Geology group as well as being available to help out other scientists, like Cliff Law. Typically, I am analysing marine sediment for for grain size and carbonate content, but I also work on foraminiferal (a type of plankton) assemblages, which can be used as proxies for climate change. I think the impacts of climate change will have big impacts on future generations, especially for food gathering, but also coastal erosion as reef-building species could be compromised. Increasing our understanding of the resilience of some species to decreased pH and increased temperature is important for future generations. At high school my favorite subject was biology - consequently my BSc was in Botany and Ecology. My husband and I moved around a lot, so I started my degree at SFU in British Columbia, took a ten-year break and started up my studies again while we were living in New York, finishing my degree at VUW. More understanding of how marine organisms relate to changes in pH and temperature. I love working as part of a team. It’s a bit like going to sea, without getting seasick! I lead Research Aim 5 (or RA5: Selection of coastal species for resilience to low pH); I am a key researcher in both RA4 and 5. My broad role is to apply high resolution biological tools to provide a deeper practical understanding of health and performance in commercially valuable shellfish. For CARIM this involves integrating my work with the selective breeding of Greenshell mussels and laboratory methods to better understand the specific effects of coastal acidification changes. My focus here is upon the performance of larvae and the energy investment choices made by growing juvenile and adult mussels. The story is completed by exploring what we call ‘trans-generational resilience’. This is where we go beyond Darwinian evolutionary theory and explore the potential for breeding mussels that have been exposed to coastal acidification stress to then impart resilience to their offspring. This is a rapidly evolving job, to cope with a rapidly changing world… there is no average day. In spring you might find me working in the shellfish hatchery, studying fertilization (the genesis of life) and the critical first few hours of development in the unprotected embryos. By autumn I may have followed the growing shellfish to a point where individuals can be handled safely, moving them into the physiology lab to study metabolic performance and feeding. The rewards and frustrations of data analysis are a big part of my life, culminating in the most critical step: interpreting and communicating findings to our commercial, environmental and community stakeholders. Understanding ocean acidification is critical for our role within the global community; however, coastal acidification research specifically explores the challenges and opportunities in our own back yard. The coastal environment is, by definition, influenced by the land it surrounds. Understanding coastal acidification dynamics and the implications for key ecological and commercial species allows us to make informed, proactive management decisions – not only about the way we operate within the coastal zones, but also the catchment areas that influence those zones. I didn’t do well in the constrained learning environment of high school. However the academic freedom of university suited me very well. I followed my passion, studying marine biology at the university of Wales. I then turned this learning into practical research skills, completing a master’s degree in commercial shellfish biology. This subsequently spring-boarded me into a career in aquaculture research. A desire to learn more about the detailed functioning of the animals I studied eventually led me to NZ and a PhD studying the physiology of the magnificent pāua. This is an innovative, multi-disciplinary programme that explores uncharted research questions. It is far too soon to guess what we might find. What we will NOT do is simply present another hopeless image of the future. A key component of the CARIM programme will be to emphasise the options available to allow adaptation, mitigation and management of acidification in the coastal zone. The programme is holistic. For the kai moana species we focus on, the project examines the entire life cycle and the food chains that support them. Shellfish are not treated as passive victims to a changing environment - rather we will specifically learn from their ability to adapt and to evolve. All of this requires a world-class, multidisciplinary team working in close collaboration using cutting-edge techniques. Who wouldn’t be excited by that? Principal Scientist Marine Ecology, NIWA, Christchurch. 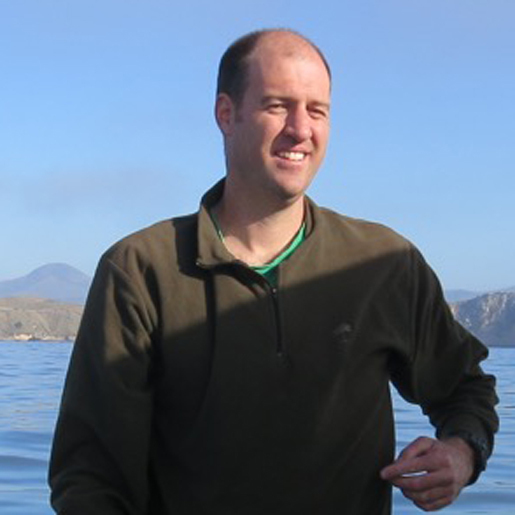 I lead the Research Aim which is building a variety of models that describe acidification in coastal waters. We intend that as well as understanding the present situation, our modelling will enable us to make predictions about what might happen in the future. I have been building a model which describes the ‘when’, ‘where’ and ‘why’ of coastal acidification in the Hauraki Gulf and Firth of Thames. The model uses oceanographic data we have collected during NIWA ship surveys in the Hauraki Gulf, combined with water quality data from rivers from regional councils and NIWA. In many parts of the world, the pH of coastal waters is decreasing (worsening) at a much faster rate than it is in the open ocean. Acidification can be stressful for marine animals and plants that rely on carbonate structures for shell-making, and even for those that don’t, such as larval fish. This is serious because so many important elements of natural marine ecosystems exist in coasts, including many of the resources we use. In high school I studied English, Spanish and all branches of science. At University I concentrated on sciences, but I still dabbled in stuff like Russian literature and anthropology. I think we will understand a lot more about what causes coastal acidification, and what we might be able to do about it. We also will learn about what effects it is having now, and could have in the future, on some important elements of the marine ecosystem. I get to use what I’ve learned over many years of doing marine research, to hopefully ‘make a difference’ in the health of our marine environment. PhD Student at Auckland University working at NIWA Wellington. I am working on documenting crucial baseline information on coralline algae along with my supervisor Wendy Nelson (with funding through MPI biodiversity project) and am contributing to RA4. Coralline algae is a red seaweed that is vulnerable to the impacts of ocean acidification due to the presence of calcium carbonate in their cell walls. The algae are a major component of reefs from the tropics to the poles, being important in supporting and stabilising reef structures, and acting as a settlement cue for invertebrate larvae (e.g. Pāua). Baseline information on the number of species, distribution and potential associations with particular habitat types or species assemblages for coralline algae species is very limited for New Zealand. This Information may be important in monitoring impacts of ocean acidification, which could have a range of negative consequences for coralline algae, and in turn flow on effects to the entire coastal reef ecosystem. An average day could start out in the field, in the lab or behind the computer. In the field this can involve SCUBA diving to collect samples or collecting intertidally in remote locations in southern New Zealand. Lab work can involve looking at specimens under the microscope to extracting DNA from samples. Coastal areas are very productive regions of the ocean and provide a range of services. Acidification combined with warming will cause fundamental changes to these coastal ecosystems by altering many biological processes. The research undertaken will enable the monitoring, prediction and understanding of the effects of ocean acidification. At high school I focused on the science subjects (Biology, Chemistry, Physics and Maths). I then went on to do A BSc in Zoology and Marine Science at Otago University, followed by a Masters degree in Marine Science working on scallops. The data being collected is important in building baseline information for marine coastal communities and gives the opportunity for continued monitoring and detection of change. Additionally, some aspects of the research being undertaken may enable better predictions about the future effects of ocean acidification. The opportunity to work with leading scientists and a range of community members to provide important information that may help with the further management and awareness on the potential impacts of ocean acidification. Additionally, my research is providing exciting insights into the scale of diversity of coralline algae in New Zealand. This project will help with the further development of a wide range of skills (both ecological and taxonomic based skills). It will also provide great opportunities to build and develop relationships with a range of scientist and members involved with this project. I am hopeful that this research, as part of the CARIM project, will provide many future opportunities to continue research in this field after the completion of my PhD.